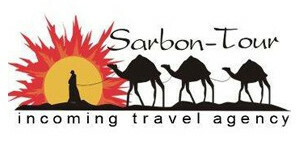 10-days Silk Way Road tour is a wonderful opportunity to get to know all the ancient cities in Uzbekistan. 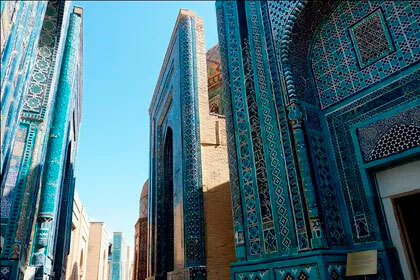 Duration: 10 days / 9 nights Сities: Tashkent, Kokand, Ferghana, Margilan, Rishtan, Samarkand, Bukhara, Khiva. You will be met by the driver and guide. 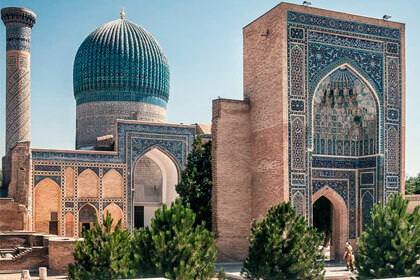 You will have a guided tour in Tashkent, the capital of Uzbekistan and the largest city in Central Asia. Early check-in at the hotel with breakfast. 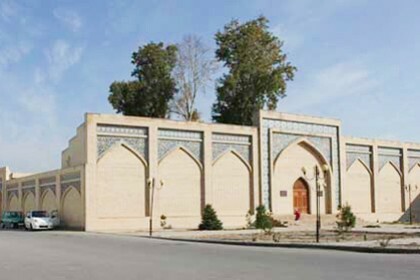 Khast-Imam Complex (XVI-XXI century) - It is here that the famous Quran of the Caliph Osman (VII century) is stored. 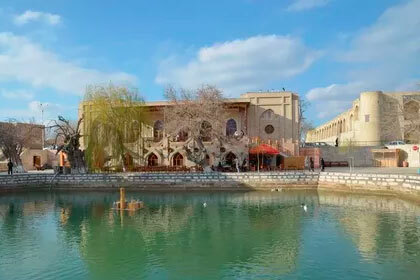 In Hast-Imam you will visit the madrasa of Barak Khan, the Tillya-Sheikh mosque, the mausoleum of Kaffal Shashi and the Imam al-Bukhari Islamic Institute. "Chorsu" bazaar - one of the oldest bazaars of the city. Tashkent’s Chorsu Bazaar is more than one hundred years. It was also always located on the main square of Eski-Juva. Amir Timur Square and buildings around the Square: hotel "Uzbekistan", building of Law Institute (former building of the Women's Gymnasium), Museum of Amir Timur, famous Tashkent Chimes and one of the most grandiose architectural structures in Tashkent - Forum Palace. Trip to the Fergana Valley (320 km from Tashkent to the city of Fergana). The mountain serpentine, which connects the Ferghana valley with the rest of Uzbekistan, passes through the picturesque Kamchik mountain pass (2,267 meters above sea level)*. Palace of Khudoyar Khan (1871) - Pearl of Kokand - the palace of the last ruler of the Kokand Khanate Khudoyar Khan . 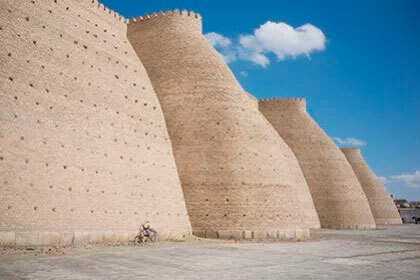 The palace of Khudoyar Khan, surrounded by a carved stone fence, consisted of seven small courtyards and 119 rooms. 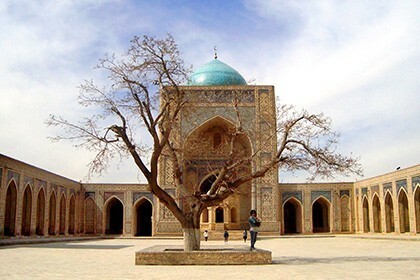 Jami Mosque (XIX century) - A real decoration of Kokand area of Chorsu. Townspeople can not imagine their hometown without this majestic mosque. It seemed to be standing here forever. 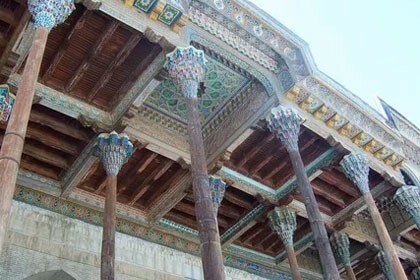 The western part of the huge courtyard of the mosque is occupied by a vast aivan, the roof of which is supported by 98 columns, and khanaka. Madrasah Kamol-kazi (1830-1832) - In the middle of the XIX century. 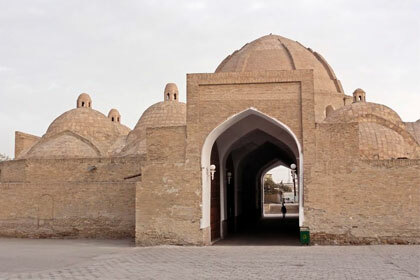 the Kamol-kazi madrasah served as a Muslim higher education institution for the children of the local nobility and consisted of a training classes - darskhony, dwellings - hujra and aywan mosque. 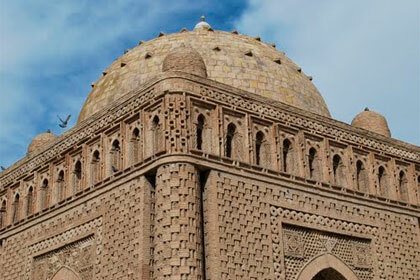 Norbut-biy Madrasah (XVIII century) - is a vivid example of the skill of Kokand architects and craftsmen. Built in the late XVIII century on Chorsu Square, it was the largest religious center of the city. Continuation of the way to Ferghana (80 km). In Ferghana we walk in the central park named after Ahmad Al-Fergani. Madrasah Said Ahmad Hoja (XIX century) - cells of which are now occupied by artisans engaged in the production of silk and carpets. This is one of the "youngest" monuments of Margilan, which is slightly more than 200 years old. Madrasahs are inherent in the harmony of the composition, the proportionality of the elements of the building and rational constructions. "Yodgorlik" silk factory (1972) - where you can see the production of silk fabrics with traditional "Ikat" patterns. Today, the factory employs about 450 people, most of whom are women. 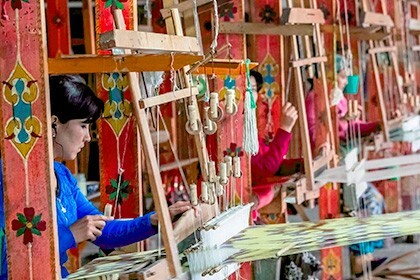 On average, over a month the factory produces up to 6,000 meters of fabric, including natural silk and semi-silk fabrics. 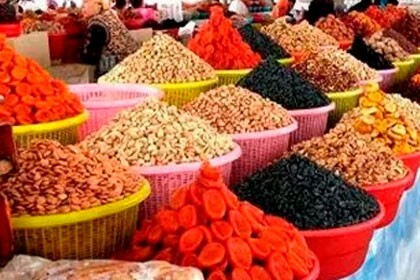 If the tour falls on a Thursday or Sunday - a trip to the Kumtepa Bazaar, the largest market in the Fergana Valley is included. In the afternoon we visit the pottery workshop of the famous ceramist in Rishtan, whose works are exhibited at major world exhibitions. After that, return to Tashkent. Registan Square (XV-XVII centuries) - is one of the most beautiful squares in the world, it is called the pearl of Central Asia. 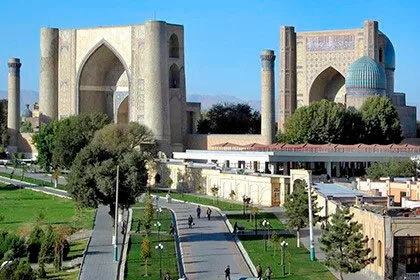 Surrounding it from three sides in the form of a beautiful architectural ensemble are: Madrasah of Ulugbek (1417-1420), Madrasah Sher-Dor (1619-1636) and Madrasah of Tillya-Kari (1646-1647). This ensemble is considered the greatest among the structures of the Islamic world. 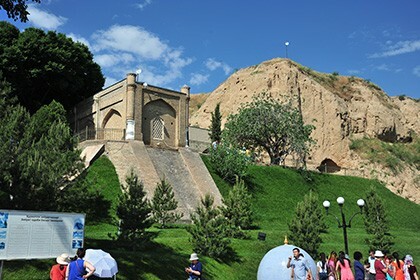 Ulugbek's Observatory (1428-1429) - Scientific works of Ulugbek were created thanks to a unique observatory, which he erected in Samarkand. The main stationary tool was a giant quadrant located inside a cylindrical building with a diameter of 48 m.
Shakhi-Zinda Necropolis (XIV-XV centuries) - Harmoniously interwoven into a living and moving composition, the mausoleums of different time periods are closely grouped along a narrow medieval street. Shakhi-Zinda consists of eleven mausoleums, which were built one after another in XIV-XV centuries. 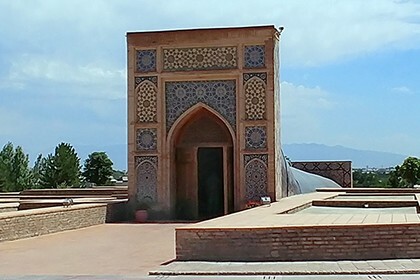 But the main mausoleum, from where the necropolis begins, is the imaginary tomb of the cousin of Prophet Muhammad - Kusam Ibn Abbas. He was called "Shahi Zinda", which means "Living King" in Persian. Mausoleum Gur-Emir (XV century) - the tomb of Amir Timur and the Timurids. This majestic complex consisted of khanaka, madrasah of Muhammad Sultan - grandson of Amir Timur and later tomb of Amir Timur himself and his descendants. Subsequently, Gur-Emir served as a prototype for the famous monuments of architecture of the Great Mogul era: mausoleum of Humayun in Delhi and Taj Mahal in Agra, built by descendants of Timur, who ruled in Northern India. Tomb of Saint Daniel (1900, but the grave itself is much older) - There is hardly a place in the world where Muslim, Christian and Jew would come to pray. 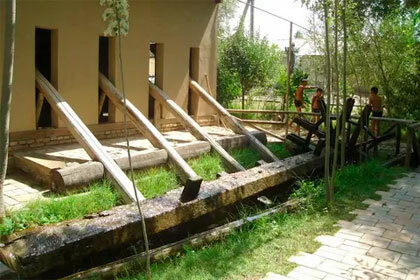 The stretch of the building is directly connected with the tombstone, 18 meters long. Caravanserai Rabat-i-Malik (XI century) is the summer residence of the Karakhanids. Only the foundation of the building and the entrance portal are left. 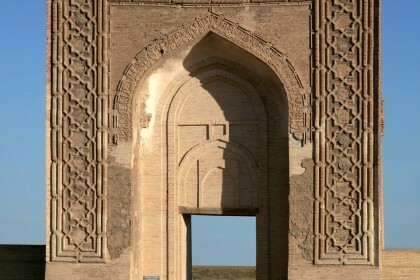 Rabat-i-Malik is the only surviving monument to the palace of the Karakhanid era. Miri-Arab Madrasah (XVI century) - is a functioning madrasa where future imams and religious mentors are trained. And on the domes of the madrasah storks nest, from year to year, flying here from Egypt. Madrasah of Abdulazizhan (1651-1652) - There are images of the Chinese dragon and Semurg bird. 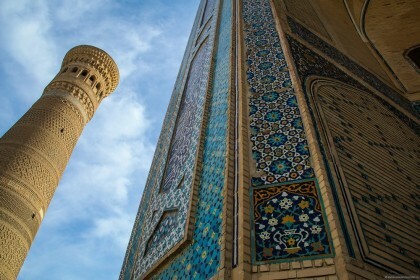 In the madrasah there are two mosques - winter and summer. 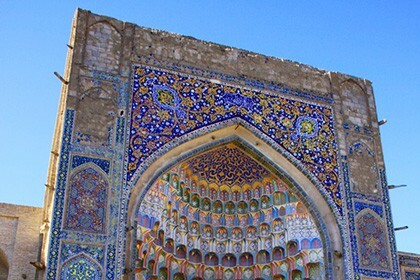 The portal of the madrasah is striking with its height and rich exterior decoration. Trading domes: Toki-Sarrofon Trade Dome (formerly the largest currency exchange in Central Asia), Telpak Furushon Trading Dome (in which hats were sold, later it gave way to the souvenirs of local artisans), Trading Dome of Tim Abdullahan (carpets and fabrics), Trading dome Toki-Zargaron (Once there were 36 jewelry shops). 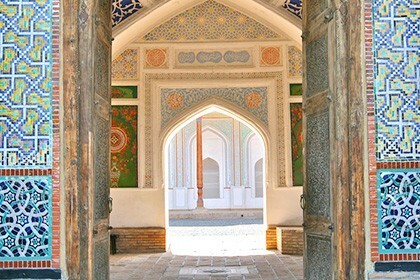 Lyabi-Khauz complex (XVI-XVII centuries) is a historical source of water supply in Bukhara. Three monumental monuments of the 16th-17th centuries were built around this ancient basin (36х42 m) 5 m deep. 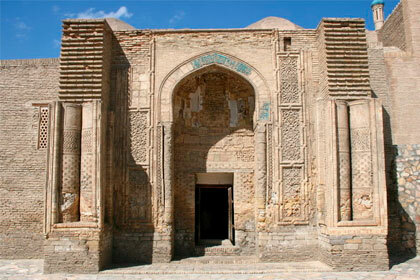 They are madrasah Kukeldash (1568-1569), khanaka (1619-1620) and madrasah Nadir Divan-Begi. All of them form a single ensemble. 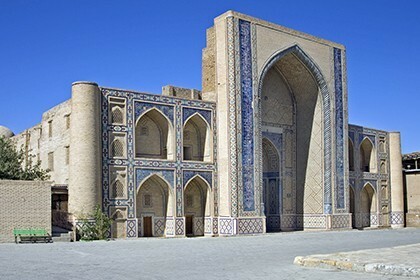 Bolo-Hauz mosque (1712) is the only surviving monument in the Bukhara’s Registan Square. 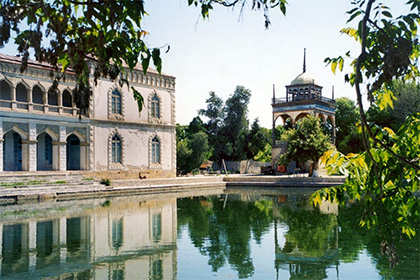 The complex consists of a pond, a Friday mosque and a minaret. 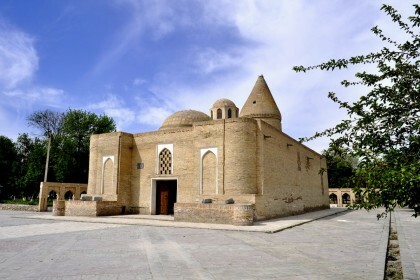 Mausoleum of Samanids (IX century) - the family burial vault of the rulers of the Samanid dynasty represents one of the best examples of the architecture of the reign of the Samanid dynasty (875-999). Mausoleum Chashma-Ayub (XII-XVI century) - in translation meaning "Source of the Holy Job". The legend says that the biblical prophet Job, visited this land and decided to help people suffering in the desert from lack of water. He struck the ground with his stick, and in that place appeared a source of crystal clear water. Mausoleum of Bakhouddin Naqshbandi (1544) - the founder of the Sufi Order of Naqshbandi. Every self-respecting Muslim knows and respects this name. 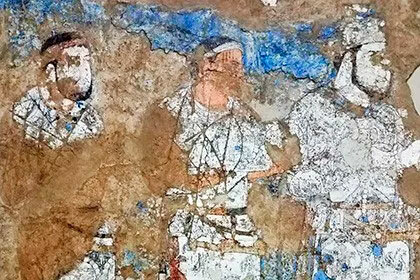 It is known that Nakshbandi was Temur's spiritual instructor and performed hajj to Mecca 32 times. 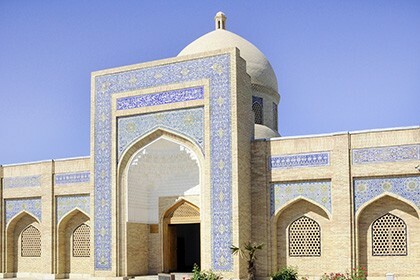 The mausoleum of Saint Bakhouddin Naqshband is considered to be Central Asian Mecca. 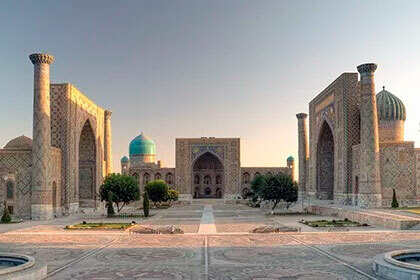 In the morning: departure from Bukhara to Khiva (480 km, 7-8 hours). The modern highway crosses the Kyzylkum desert, repeating the ancient route of the Great Silk Road *. Stop on the way, during which you will have the opportunity to enjoy panoramic views of the desert and the Amu Darya River. Arrival in Khiva at the end of the day, check-in and rest at the hotel. 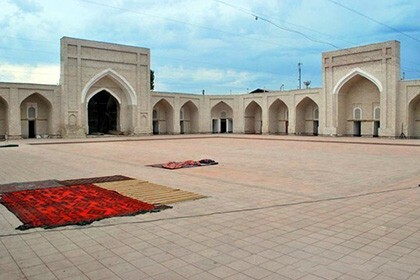 Madrasah of Muhammad Aminhan (1851-1854) - This is the largest madrasah not only in Khiva, but also in the whole of Central Asia. The two-story building occupies an area of 72 by 60 meters, and has 125 hujras (cells) designed for 260 students. 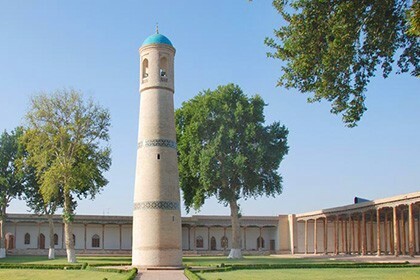 Madrasah of Muhammad Rahimkhan (1876) - Muhammad Rakhimhan was one of the most enlightened representatives of the Kungrat dynasty, who ruled Khiva Khanate from 1770 onwards. 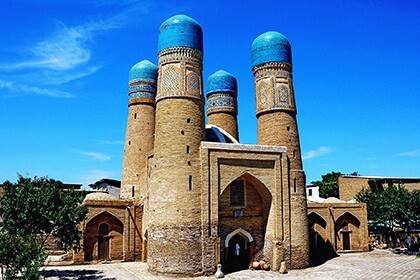 The crowning point of his activity was the erection of one of the largest madrasahs in Central Asia named after Muhammad Rahimkhan. Dinners – $65 per person in total. Lunches and dinners – $125 per person.